Chairman, president and chief executive officer for the Lockheed Martin Corporation, Marillyn A. Hewson. When you think of the Lockheed Corporation, it is beyond staggering to try and think of the immense size of the company which employs over 116,000 people. The organisation is an American global aerospace, defence and security company which has some of the most technologically advanced warfare systems in the world. It is a real conglomerate company that specialises in defence contracts primarily for American and overseas markets. The company is so big that it has its own housing and educational facilities at hand for their employees. To give you an understanding of the grand scale they are working at, in 2013 the company’s revenue was $90billion, their operating income was $9bn and profit for the year was $6bn or to break it down further the company reported a profit of $500million every 30. Ms Hewson was born in 1954 in Junction City, Kansas, USA. After finishing her high school education, she went on to study at the University of Alabama where she earned her Bachelor of Science degree in Business Administration. After completing her degree she then took her Masters of Arts degree in economics and also attended the prestigious Columbia Business School and Harvard Business School to complete her education. Being well groomed and having a very impressive educational resume behind her it was now time to get serious about what type of working environment she wanted to go into. After looking at various options Marillyn joined the Lockheed Corporation in 1983 and slowly but steadily has proved herself a leader in business as she was promoted swiftly through the ranks. Moving around the company she was given a host of titles as she came to terms with the sheer size of the organisation. Having seen her leadership and business skills firsthand the board appointed her to increasingly more responsible executive roles throughout the group including chief operating officer and executive vice-president for the group. Eventually after proving herself to the board as a woman to be reckoned with Marillyn A. Hewson was made chairman, president and CEO for the Lockheed Martin Corporation as it is known now. Ms Hewson has been at Lockheed now for more than 32 years and has proved that through hard work and determination you can rise to the very top of the business world and your own barriers are the only things stopping you from succeeding in life. 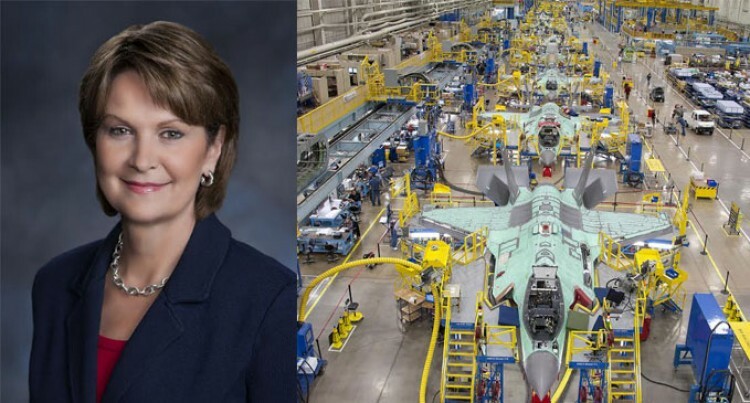 In addition to her role at Lockheed, she has been appointed by President Barack Obama as president of the Export Council for the whole of North America. She is also the chairman of the Aerospace Industries Association and is on the board of the National Geographic Education foundation to name a few. One of the roles she enjoys best is being on the Business Roundtable for America; this is made up of the leading business people in the country where they can meet, discuss and share different points of view where the nation can benefit. Ms Hewson finds great enjoyment from meeting her peers and interacting with them to find solutions for the many problems that face the nation. Finally it is only fitting that Marillyn A. Hewson, who runs one of the most commanding business organisations in the world, has been named by “Forbes” magazine as one of the most powerful and influential women on the planet.